Identification: According to Eccles and Trewavas (1989), the genus Pseudotropheus is in particular need of revision and critical appraisal. Pseudotropheus zebra alone represents a complex of about 27 species (Ribbink et al. 1983). Some distinguishing characteristics of the species complex, a description of color patterns, figures, and photographs were given by Ribbink et al. (1983). Color photographs of various species and morphs were given in Ribbink et al. (1983), Axelrod et al. (1985), Lewis et al. (1986), and Axelrod (1993); also see illustrations in Petrovicky (1988). Size varies among members of the complex, with maximum size ranging from about 6 to 14 cm (Axelrod 1993). Native Range: Tropical Africa. Lake Malawi. 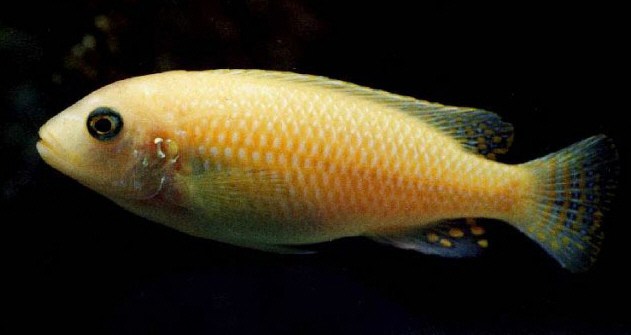 Nonindigenous Occurrences: The first report of this fish in Nevada was by a member of the American Cichlid Association, who observed several specimens of the "marmalade" form of P. zebra during a visit to Rogers Spring, a tributary of Lake Mead near Overton, Clark County, in July 1981 (Courtenay and Deacon 1982). Later records from Rogers Spring included a single male fish taken on 14 November 1981 (Courtenay, personal communication), and several individuals reportedly found in 1983 (Courtenay, personal communication). These records were apparently the basis for the listing of the species in later publications as introduced but not established in Nevada (e.g., Deacon and Williams 1984; Courtenay et al. 1984, 1986, 1991; Courtenay and Stauffer 1990; Vinyard 2001). Table 1. States with nonindigenous occurrences, the earliest and latest observations in each state, and the tally and names of HUCs with observations†. Names and dates are hyperlinked to their relevant specimen records. The list of references for all nonindigenous occurrences of Pseudotropheus zebra are found here. Remarks: This species or species complex is well known in the aquarium trade. In its native range, the true P. zebra is distributed widely in Lake Malawi and shows marked geographical variation in coloration and markings (Ribbink et al. 1983). In contrast to references given in selected published fish lists (e.g., Deacon and Williams 1984), we found no mention of P. zebra in Courtenay and Deacon (1983), a review paper on introductions into Rogers Spring, Nevada. There are no known voucher specimens; however, a photograph is on file to support record. Courtenay, W. R., Jr., and J. E. Deacon. 1983. Fish introductions in the American southwest: a case history of Rogers Spring, Nevada. Southwestern Naturalist 28:221-224. Eccles, D. H., and E. Trewavas. 1989. Malawian cichlid fishes: the classification of some haplochromine genera. Lake Fish Movies, Herten, Germany. Lewis, D., P. Reinthal, and J. Trendall. 1986. A guide to the fishes of Lake Malawi National Park. World Wildlife Fund, Gland, Switzerland. 71 pp. Ribbink, A. J., B. A. Marsh, A. C. Marsh, A. C. Ribbink, and B. J. Sharp. 1983. A preliminary survey of the cichlid fishes of rocky habitats in Lake Malawi. South African Journal of Zoology (Zoology Dierkunde) 18(3):149-310.